The photo below was taken by Russ Beinder during the 2010 Winter Olympics of Sports Illustrated photographer David Klutho’s stereoscopic Nikon D700. 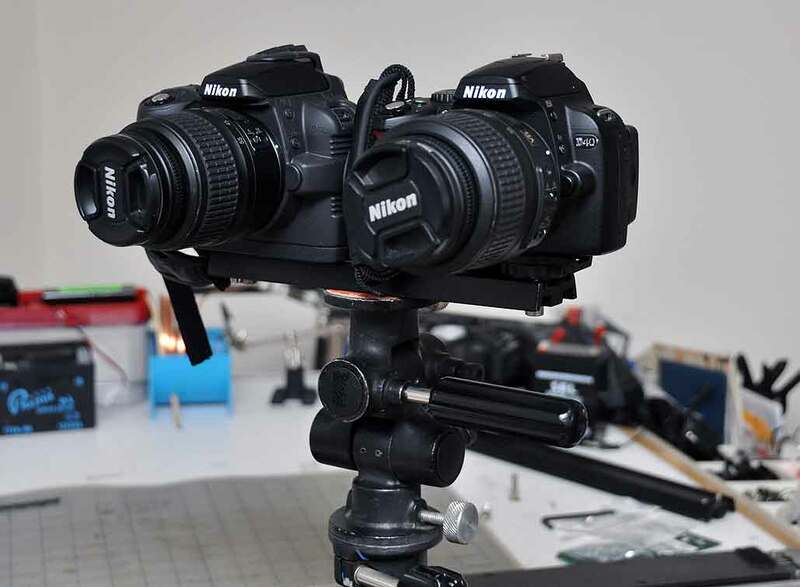 Judging by the inverted configuration, the camera on the right is the master and the one on the left is the slave. The cables and small black box on the bottom of the slave camera indicates a trigger-coupling between the two cameras. The two lenses appear to be bound by some kind of band. Its function is unclear. In any case, the rig looked pretty sweet. One of our editors has an interest in stereoscopic imaging. He doesn’t talk about it much, but rumor has it that he was one of the few who programmed a machine called the PIPE. The PIPE was one of two in the world, hand-built and housed in a “room without a window” for an unnamed agency in D.C. He is a little twitchy, so we don’t ask him too many questions or sneak up on him…ever. Anyway, he thought it should be possible to rig up something similar to Photographer Dave’s with gear we already had in house: two Nikon D40s, mounting rails, screws. We obviously would not have any of the specialized triggering of Dave’s rig, but we still would have enough to can play and experiment. The telescope rail mount is a good choice for this project. We could have made one from a strip of aluminium. However, this one was already pre-drilled, threaded, and cost less than $15 from Orion. It was also stiff, nicely anodized, and just the right size. We picked up some 1/4″ steel screws for attaching the cameras to the rail. We weren’t certan what length screws we needed so we got both the 3/4″ and the 1″. Because of the difference in the grips we had on the cameras, the 3/4″ worked better with one and the 1″ worked better with the other. OK. We found we could set up a rig, but how to synchronize everything? We don’t know squat about stereo photography, but how hard can it be… really? Well, I think we are about to find out.